This Symbala was created for Steven Forrest, an internationally famous astrologer and author. Reading his book, The Inner Sky was a real turning point in my life, opening new possibilities for personal growth. This is the third Symbala or second Renewal I've created for Steven. Many years have passed since I last connected with Steven's energies and the changes were huge, reflecting his shifts and mine, both personal and as an artist. Steven's birthdate is January 6, 1949, making his birth number a 3. 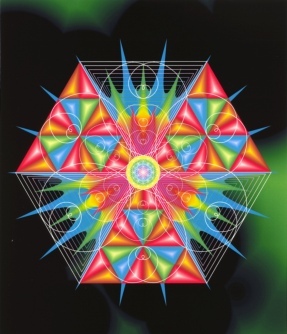 The geometric resonance of 3's is very active, sort of a creative overdrive! That certainly fits Steven. But here are Steven's own words about it. Steven designates himself as: Astrological Counselor, Teacher and Writer. Desert Rat. Cat Slave. Guitar player.